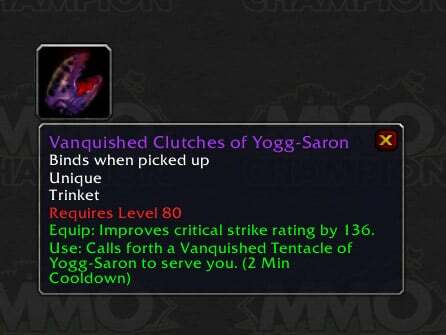 They really need to make some giant flailing tentacle battle/vanity pets... a while back a player with Vanquished Clutches of Yogg-Saron out in Org and I mistakenly assumed that it was the greatest battle pet I had never seen before. I spent at least an hour searching for it; first in the Pet Journal, where I went through every single pet in the game one-by-one, and later in the image database for the WarcraftPets website, to no avail. Oh wow... don't ask me how I missed it, but there IS a tentacle battle pet in the game: Jade Tentacle. Sadly, that is the only one, and the only way to get it is from a Pet Battling meta-achievement that I won't be getting anytime soon, if ever. It is only awarded to elite Pokémon Masters who earn 400 achievement points from Pet Battle Achievements.